to our troops in Iraq & Afghanistan! Trowbridge Tavern in Bourne, MA. Cape Cod Cares for the Troops is proud to present a Memorial Bench in honor of Sgt. Mark Vecchione. Mark was killed in Iraq in July of 2006. The beach is located on the Eastham Windmill Green and was dedicated in his honor to his mother Cynthia Deslauries, his sister Laurie Vecchione and nephew Sabastian. We will forever be grateful for his service to our country and promise never to forget the ultimate sacrifice Mark and his family have made. "Candy Exchange for the Troops"
Over 20 pounds of candy was donated to Cape Cod Cares for the Troops for the Christmas Care Packages being sent to our troops in Iraq and Afghanistan. $1.00 was paid for each pound of candy donated. Plus a goodie bag and new flashing toothbrush were given to each child who donated candy. Thank you to everyone at East Brewster Dental (photo above) and to those who donated candy. If you missed it this year, plan to be there next year!!! employees at Balls to the Wall we appreciate your continued support. 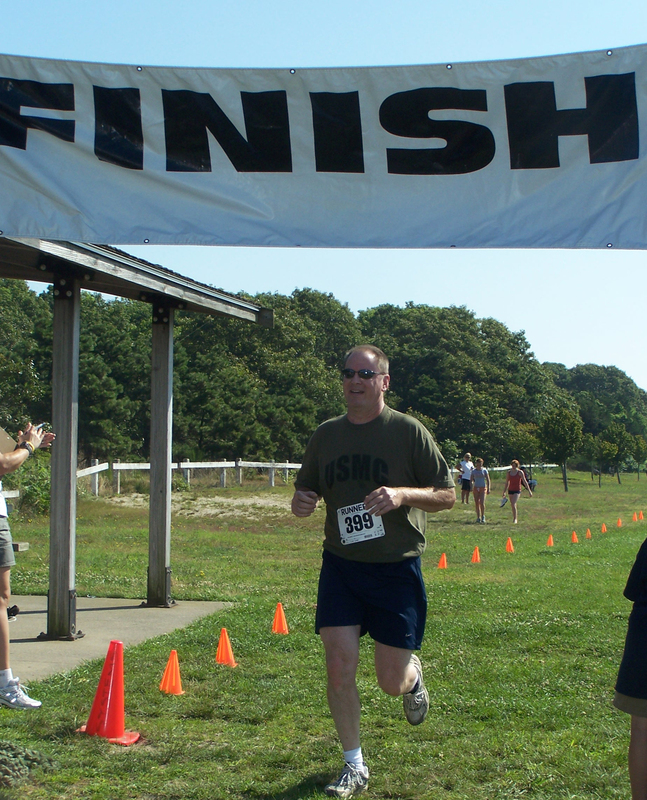 The first annual Canal Run for the Troops was held on Saturday August 24th 2009 along the Cape Cod Canal. There were over 300 participants in the 2.5 Mile Fun Run/Walk and 240 runners competed in the 14 mile run. $15,000. was raised for Christmas Care Packages for the Troops. Cape Cod Cares for the Troops plans to send 1000 Christmas Care Packages to our troops serving in Iraq and Afghanistan. The event was also to honor the Gold Star Families of the seven Marines/Soldiers from the Cape who were killed in action while serving in Iraq and Afghanistan. 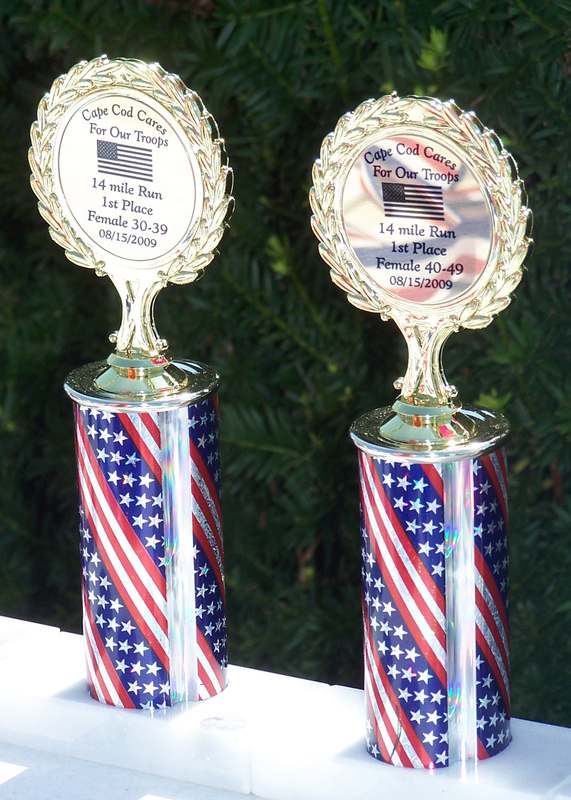 We would like to thank everyone who participated, made a donation, volunteered or sponsored Canal Run for the Troops. A special thank you to Tom Lynch for organizing the event and Harry Pratt for being the Race Director. the opening of the annual town meeting. Dylan was received with a standing ovation. Steve Silverman - District 7950 Governor presented Dylan with the Rotary Foundation's "Paul Harris" award. Dylan received this award for all the support Cape Cod Cares for the Troops has provided our troops serving in Iraq and Afghanistan; our veterans and Wounded Warriors; and the people of Iraq and Afghanistan by providing support to schools, orphanages, medical and dental clinics in both countries. from the Wounded Warrior Unit at Fort Belvoir, VA.
their all to our country and they deserve our continued support. Dylan has promised the continued support of Cape Cod Cares for the Troops. Sgt. Major Christopher presents Dylan with a challenge coin.